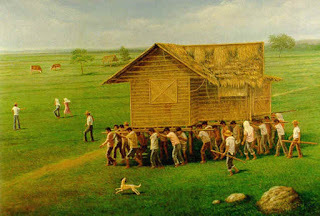 Home » Cooperation » History » Pinoy brain » Pinoy Trivia » Tradition » What do you called the Filipino Culture helping each other? » What do you call the Filipino Culture helping each other? What do you call the Filipino Culture helping each other? A traditional system of mutual assistance in which the members of a community work together to accomplish a difficult task. In later use also: a spirit of civic unity and cooperation among Filipinos. It is helping out one’s neighbor as a community, and doing a task together, thus lessening the workload and making the job easier. It is also called the ‘community spirit’. It is best exhibited when people wish to move locations in the rural area. The traditional Filipino house, the ‘bahay-kubo’, can be moved using wooden poles which are carried from the old place to the new one. This requires a group of people to lift and carry the house on their shoulders. Able-bodied men usually participated in such feats, while women stood and watched, casually chatting and cheering the men on. Afterwards, there will be a small gathering as a form of celebration and socialization.